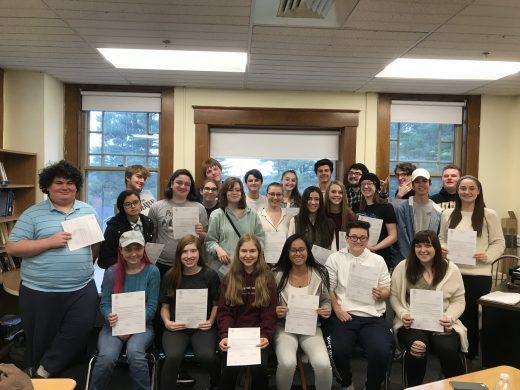 This year 26 seniors, representing 28% of the Class of 2019, at Innovation Academy Charter School (IACS) earned the John and Abigail Adams scholarship. This award marks high achievement on the Math, English Language Arts, and Science MCAS exams. Recipients of this four-year scholarship are granted a tuition credit each year. The amount will depend on the specific state college or university a student attends, but at UMass it is currently equivalent to $1575 per year. This year’s recipients are: Carolyn Brooks, Katelynn Brown, Sebastian Chavez, Kaylin Donoghue, Ian Fastert, Aiden Felty, Shaun Fraser-Mines, Leticia Freire, Hannah Goldthwait, Emily Green, Abigail Kelsey, Jennifer Klein, Ira Libby, Grace Linskey, Sydney Malen, Natalie Mayo, Chris Mennella, Carter Morgan, Selena Ou, Marcel Paolillo, Lauren Pichette, Amanda Pollicelli, Tristan Row, Anthony Simao, Margaret Torkildsen, and Benjamin Vig. Congratulations to all for earning this recognition.